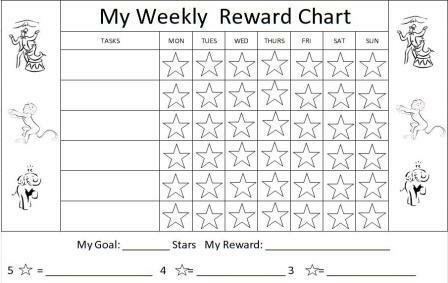 Download free printable reward charts for kids to motivate completion of chores or to help with a child behavior problem. 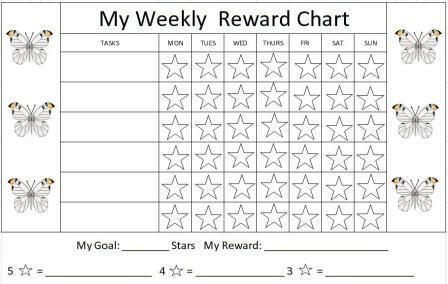 Each sticker chart may also be used with blank award certificates as a fun way to provide your child with positive behavior supports. Raising children is tough. They never want to do what you ask, when you ask them to, BUT if you can help them see the reward involved in doing what you ask, it's like magic in getting them to listen. I've noticed with my own children, I can get them to almost do anything when there is some type of reward involved. However, I always like to mention the importance of implementing other strategies in conjunction with a behavior chart that can help with other behavioral problems you may be having. These are all outlined in my free eBook Taming Your Child's Inner Tiger, so be sure to check it out! When using each chart below every square has a star in it, so that a kid can color it themselves when earned (kids think this is so much fun! ), but you may also use them by placing a sticker in each square as well. I've noticed that younger children especially love these to help them know what to expect each day. Even if you only give them simple tasks of cleaning up their room, picking up their toys, or hanging up their coat, it helps them to learn to contribute to the family and be proud that they are helping. Be sure to talk about the number of stars that will need to be earned to meet the preset goal and win the biggest reward. 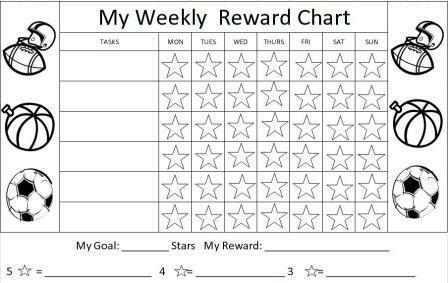 Then, in order to encourage baby steps as well, list some smaller rewards your kid may be able to earn for lesser amounts (the dollar store is great for this). Give praise for each star and in time you should be able to gain compliance with praise only. You will need to turn off any pop up blockers and adobe reader to download the printable reward charts. A link to download this is below. All you have to do is fill out the form below and an email will be sent with all three printable reward charts for you to download. I have created most of my charts with very little color so that you don't need to have a color printer in order to enjoy them. Have your kids get involved by having them by color the pictures themselves. You will need Adobe Reader (the latest version is recommended) installed on your computer in order to open the printable documents. You can get Adobe Reader here (a new window will open so you can download it without leaving this page, but you will need to temporarily disable any pop up blockers to open the new window and the reward chart). If you want to open the file in your browser window, just click on the reward chart. However, if you want to download the file to view later, then right-click on the link and choose "Save Target As" or "Save File As." Then select where you want to save the file on your hard drive. Once you have saved the printable file, locate where you saved it, and double click to open. When using all of these strategies in combination with the reward charts, you are likely to notice a huge difference in your child. If you don't seem to be seeing improvement, make sure you took time to read my free printable eBook that outlines proactive strategies or view the behavior help section for help with specific behaviors.